A geological survey found Washington DC and the surrounding Chesapeake Bay region is gradually sinking. By the end of the century, the Chesapeake bay would be six inches lower than it is today. This is due to a natural phenomenon, not man-made global warming. But when the two add up, it could put the nation’s capital a couple of feet under water, significantly affecting the lives of local residents and the city at large. Sea levels in the region are rising faster than anywhere else in on the East coast, according to the geologists at the University of Vermont. The team drilled 70 holes each hundreds of feet deep in the Chesapeake Bay region to find out how the climate was over the last couple million years. The information from the sediments was then used to design a 3D map which showed the region was sinking 3.4 mm per year, compared to the average rate of 1.7 mm per year across the East Coast. This is due to what scientists call “forebulge collapse.” During the last ice age, a thick ice sheet further north exerted such a huge pressure that the area further south, now home to Washington DC, pushed upward. After the ice melted, the region started to sink back. And indeed, some people in Washington DC are already getting ready. For instance, managers are designing landward migration of habitat through easements and land acquisition to ensure the persistence of tidal marsh beyond 2100. 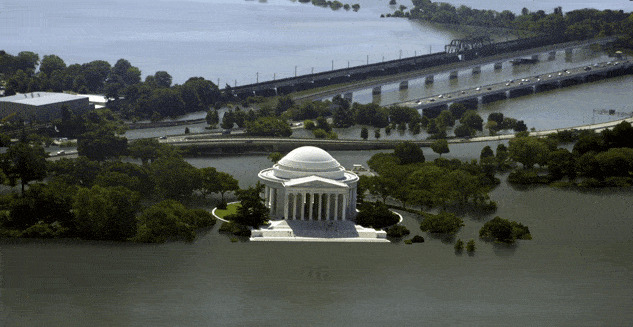 Just six inches could mean a lot for Washington DC (without counting global warming sea level rise potential). “Bridges, military facilities, national monuments and portions of the rapid transit system,” in addition to about 70,000 residents could be threatened, according to the study authors.